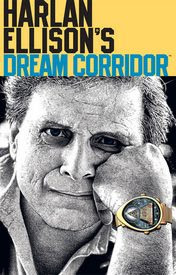 HARLAN ELLISON digs our book! i should point out that harlan actually called me several months ago to tell me this. he told me that he thought the perhapanauts was a fun and compelling book, that he really liked the story! and then cautioned me against overusing character dialect and vernacular too much. (molly DOES say "like" a lot...) we had a nice conversation and, of course, i was quite honored. i mean, c'mon--HARLAN ELLISON!! and so i called him back the other day to thank him for the mention, and for my pal, ron marz as well, since harlan also gave great prase to ron and luke ross' book, samurai: heaven and earth. it just happened to be harlan's birthday, so i wished him a happy one and let him get back to his celebrating. so happy birthday, harlan--and thanks again! with so much going on these days, i must admit that i've been quite remiss in keeping this blog on schedule and apologize for it. but i've also been at a bit of a loss as to what to write about. with no actual publishing date set for a new perhapanauts series, there's nothing to tell there. and there's been very little going on in the world of the paranormal or unexplained that has been inspiring enough to follow up with here. the "five on friday" trivia seems to garner some response, but i'd like to blow the doors open a bit and try to inspire more people to write in with comments and stuff. i dunno. maybe this idea will tank. and also, it's JAKE'S BIRTHDAY!!! South Park: Bigger, Longer & Uncut: The only musical I have ever loved. Monty Python and the Holy Grail: Like many a nerd, I know this movie inside and out. Ferris Bueller's Day Off - John Hughes's magnum opus. I was wanted to grow up to be like Ferris, sadly I turned out exactly like Cameron. Avatar: The Last Airbender - I'm not even embarassed to admit that this is the my favorite tv show right now. Damn shame that Mako (voice of my favorite character "Uncle Iroh") passed away last year. Justice League Unlimited - Bruce Timm and co. did a fantastic job of bringing together all the corners of the DCU into a brilliant cartoon. Clone Wars - Proof positive that Star Wars can still be done right. Gargoyles - One of the rare times Disney does a bang up job with action/adventure. Herculoids - They've got a giant rock gorilla. Need I say more. That is way cool about Harlan as his comments about Infinite Crisis and Civl War show that he doesn't mince words. In no particular order: Something About Mary, Airplane, Young Frankenstein - The Gene Hackman scene still makes me laugh, Animal House and Annie Hall. Top Five Songs, again in no particular order: Bruce Springsteen, "Candy's Room"; Jane Oliver, "Come In From the Rain"; The Motels, "Total Control"; Aimee Mann, "Mr. Harris"; and Warren Zevon, "Lawyers, Guns and Money." Jonny Quest, Batman Beyond, Justice League/JLU, Batman and Superman. He did not just ask who Harlan Ellison is, did he? Mercy Me "Here Am I"
They Might Be Giants "Why Does the Sun Shine"
Iron Maiden "Rime of the Ancient Mariner"
5. Any Peter Sellers Pink Panther movie. I left The Simpsons off my list because as the greatest tv show ever, it transcends cartoon. Same for Looney Tunes. And yes, walt, I have no idea who Harlan Ellison is. thought i'd wait a bit and let you all log in before i put mine up. and thanks to you all--you're the BEST!--for posting and getting involved! no, scratch mr. and mrs. smith--it's hilarious, but i can't believe i forgot one of my all time favorites--the thin man! always makes me laugh! I'm really horrible at lists... actually, I'm just horrible at remembering "favorites," so that's why I haven't posted mine.